Great news! OG’s Speculative Fiction, Issue 22 has been released! In Dawn Lloyd’s “Mr. Pinenut” a man gets a second chance at love, but does he take it? Benjamin Crowell’s “Fork” will rearrange your thinking on alternate realities. 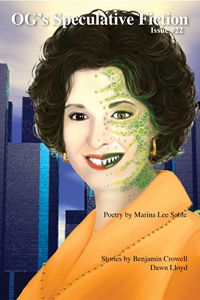 Also included is poetry by Marina Lee Sable. Let us know what you think of the issue! Don’t miss our other issues of OG’s Speculative Fiction if you haven’t read them.